In Pennsylvania, June 27 is commemorated as Helen Keller Day. Helen Keller was an American author, lecturer and political activist. She is noted for being the first deafblind person to earn a B.A. degree. 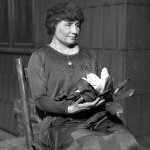 Helen Adams Keller was born on June 27, 1880. She lost her ability to see and hear at 19 months old due to an illness (either meningitis or scarlet fever). In 1886, Keller's mother started looking for a person who could educate her daughter. Anne Sullivan, herself visually impaired, agreed to become Keller's instructor. Keller attended several schools for the blind and deaf. At age 20, she was admitted to Radcliffe College in Cambridge, Massachusetts. She graduated in 1904, becoming the first deafblind person to earn a B.A. degree. Keller learned to speak and spent much of her life giving lectures and speeches. She was an avid advocate of people with disabilities. In 1915, she founded Helen Keller International, an organization devoted to research in vision, nutrition and health. In 1980, President Jimmy Carter authorized Helen Keller Day at the federal level to commemorate the centennial of Keller's birth. That year, the United States Postal service issued a special stamp depicting Helen Keller and Ann Sullivan.